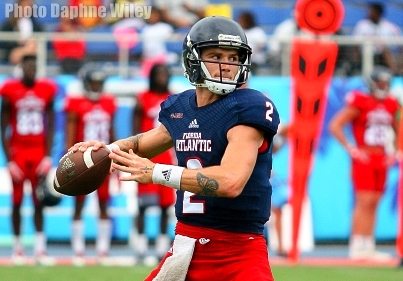 FAU Football held their annual spring game at FAU Stadium today, the program’s first traditional Red/White format in its 18 year history. The Red Team was coached by former UCF Standout and running backs Coach Kevin Smith and the White Team were coached by Offensive Coordinator Charlie Weis Jr. This allowed for Coach Lane Kiffin to bounce around and work with all units. The White Team was led by Quarterback De`Andre Johnson, while the Red Team was led by Chris Robison (photo). Both are in a battle to become the starting signal caller, however the game was won by Robison’s unit 20-14. A recap of scoring, with commentary can be found here. Below are some of the things we learned from the final official meeting the team will hold before beginning camp later this year in August. Today, neither quarterback set themselves apart from the other. De`Andre Johnson had some solid runs, utilizing his speed. Unfortunately, Johnson was inconsistent in the through the air (21-of-44, 175 YDS, 1 TD, 1 INT). He tends to struggle with the deep ball. Chris Robison (14-of-26, 172 YDS, 1 TD, 1 INT) made some nice throws today, but when faced with pressure from blitzes, struggled to make quick decisions. Expect the competition to remain unsettled until camp begins. It would not be a surprise if Kiffin waits until game week against Oklahoma to make a decision. This is a great problem to have for college footballs youngest offensive coordinator. The offense still has players that were recruited by then Coach Charlie Partridge, and newcomers from Coach Kiffin`s tenure. Partridge recruit John Raine made some great plays in the “H Back” role, totaling 4 catches and a touchdown. Dante Cousart, a Dwyer alum, had 3 catches for 30 yards. After the game he said how happy he was to play in front of friends and family. “I`ve got coaches here from Dwyer, its great” said a thrilled Cousart.” He has done a great job this spring, and has seen more playing time as a result. Dwyer alum Gerald Hearns presented solid runs totaling 23 yards. Last season’s leader on the gournd Devin Singletary was held out today by the coaching staff. As usual, Willie Wright was used in a “super utility role” as he took some snaps in the backfield as well as in the slot. Wright had 7 catches on the day. Today we got to see the debuts of transfer receivers Jovon Durante and Kyle Davis. Davis had a relatively quiet game, whereas Durante scored on a touchdown pass from De`Andre Johnson. Durante`s speed and vertical ability will cause some Conference USA cornerbacks to lose some sleep in the fall. Davis is a former four star recruit who has the size to play at the next level. Other weapons for the offense next year include running backs D`Anfernee McGriff, Kerrith Whyte Jr. Expect vet wideout DeAndre McNeal to catch some balls next year along with Tight End Harrison Bryant. During the contest, we saw Senior Linebacker Rashad Smith make plays all over the field. Smith totaled 4 tackles, a sack and an interception. New defensive coordinator Tony Pecoraro took advantage of Smith`s versatility. He was sent on blitzes, dropped into coverage on passing downs. In the first quarter Smith recovered a Gerald Hearns fumble and returned it twenty five yards the other way. Expect ballhawk safety Zyon Gilbert to have a huge sophomore campaign. Gilbert was able to crack the starting lineup as a freshman for the Conference USA champion Owls. This is something that would make Coach Kiffin happy, and it’s true. The secondary is loaded with players looking to get playing time and has a big mix of youngsters and vets. Ocie Rose, Shelton Lewis, Ahman Ross, Zyon Gilbert, Savion Harris, DaSean Cannon, just to name a few, are all in the running. The “H back” role is a battle between John Raine and Harrison Bryant. Transfer Charles Cameron was given a lot of snaps on the defensive line, recording a sack. He will be battling with vet Hunter Snyder, Romello Martin and Marcell Southhall for playing time. Another highlight for the defensive line was defensive end Tim Bonner who picked up a sack. Ernest Bagner would seem a deserving recipient of a defensive game ball as he had three sacks and five stops in the backfield. Coach Kiffin had mixed reviews about the session. Ball security and good decision making will be key for the Owls if they hope to continue to make a national impact. For now, both Kiffin and the coaching staff have some significant takeaways for the upcoming season to continue their strategy formulation. However, we will likely see more twists and turns in the lineup before the Owls take the field against the Oklahoma Sooners on September 1st. Coach Kiffin's post game press comments can be found at the ink below.